In my family, we ate tortillas at every dinner meal, fresh off the comal. Sometimes we ate tortillas for breakfast and lunch as well. If there were any tortillas left over, we would reheat them for another meal, but my dad refused to eat them unless they were freshly made. I was the oldest of eight kids and it was my job to help my mother make the tortillas. She and I cooked them as the family ate; we had to keep getting up to make more and I don’t remember ever being able to sit down for a whole meal. One day I decided that my younger sisters and brothers would only be allowed two tortillas per meal; that way I wouldn’t have to keep getting up. My dad, though, got as many as he wanted, so my idea was short lived. There are many versions of the old Mexican joke involving tortillas. The one we were told involves an argument between Moctezuma and Cortés, but sometimes it’s between a peasant and a conquistador. Generally, the argument begins with one person saying to the other, “I know someone who eats each bite with a different spoon.” In any case, the underdog wins. Hayes’ Spanish version reads as well as the English, so that both Spanish-speakers and English-speakers can learn and enjoy the idioms of the other language. Leer’s artwork is rendered in pastels on a palette that reflects the colors of Southwestern flora, fauna, and architecture. I especially like the facial details—the Mexican aristocrat’s out-of-control handlebar mustache and his look of horror when he finds out he’s been had, his servants’ bemused expressions at their boss’s extravagance, the couple’s loving and semi-conspiratorial glances at each other. Perfect. Sometimes when a joke or a riddle is stretched out into a story containing characters and dialogue, the turns and twists become contrived. Here, my problem is suspending my disbelief that the poor couple doesn’t eat tortillas, because to do so would have given away the punch line. Maybe there are Mexicans who don’t eat beans with tortillas; I haven’t met any. Nevertheless, the story resonates with me—arrogant rich people getting their comeuppance from poor people just makes me feel warm inside. 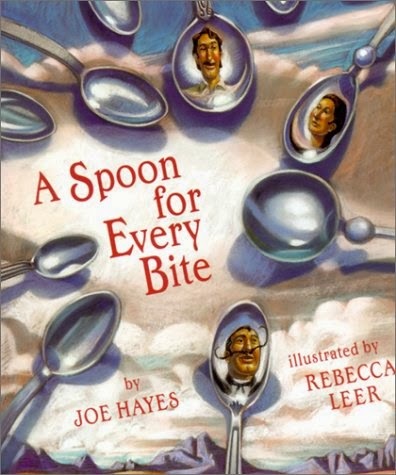 A Spoon for Every Bite / Una Cuchara Para Cada Bocado is recommended.